Enjoy thrifting as much as I do? Check out my latest finds and what I plan on doing with them! As many of you know, I like to go hunting for vintage pieces quite frequently. After cleaning out our basement storage rooms at the completion of our renovation, I vowed I wouldn’t bring home any more fix-me-up pieces until I had dealt with the ones already stockpiled. I’m like the addict who starts to make excuses or hide things so her dirty little secret isn’t found out! Since the basement purge, I have found a few treasures in my shopping adventures I just couldn’t leave behind. 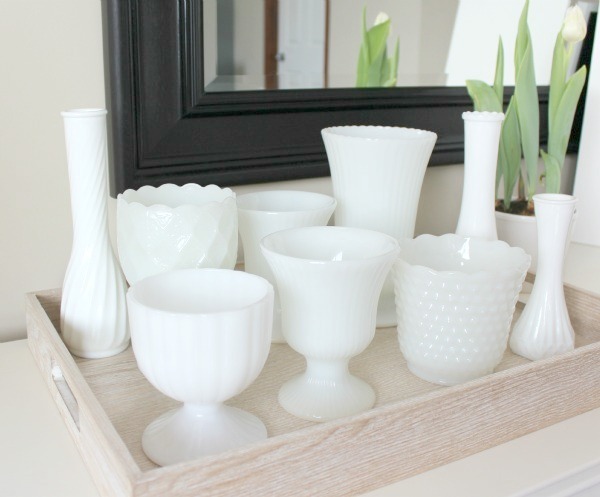 I started collecting milk glass (authentic and reproduction) a while ago and love how it all looks together. Pieces I picked up have ranged anywhere from $.25 to $4. Eventually I’d like to arrange them on an open shelf in our kitchen like this display. 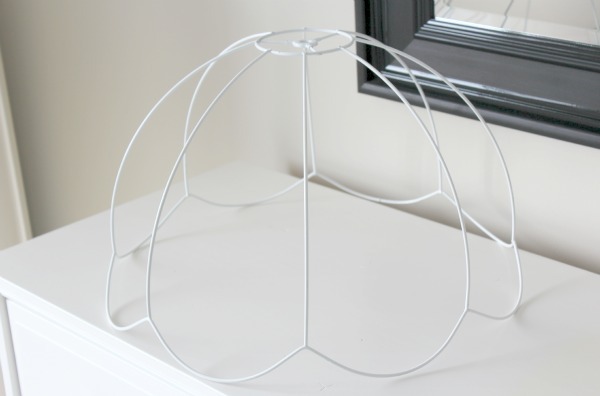 I spotted this $1 lamp shade frame at our local thrift shop and thought it was the perfect jumping off point to recreate Nester’s book page chandelier (as spotted below) for my office. 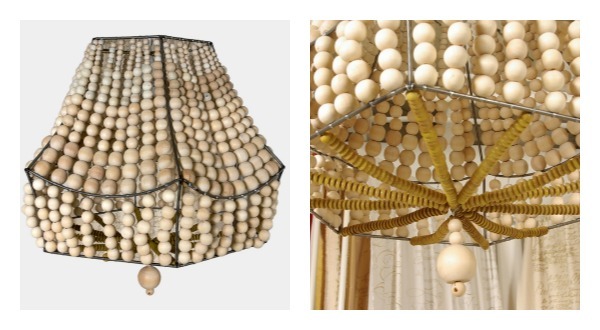 As an option, I’ve also considered making a beaded cage pendant light like this one spotted on 1st Dibs. It’s a very ambitious project, but I think it would be so worth it! These Italian glass bottles totalling $2 for the bunch were exactly what I was looking for to hold these Martha Stewart drink mixers for my son’s graduation party in July. 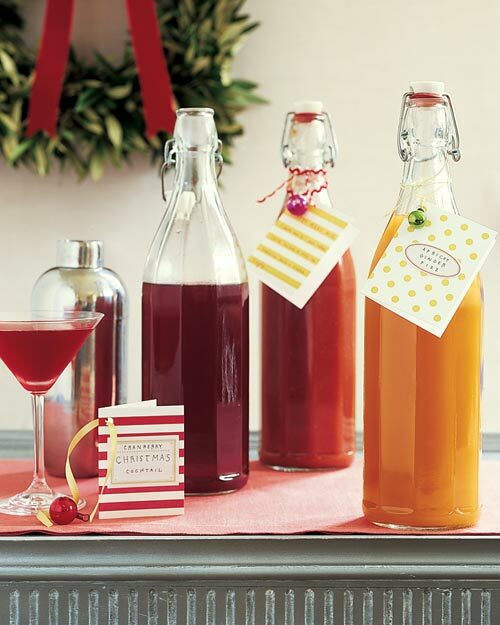 They will also work well for some of the refreshing drinks I make throughout the rest of the summer. And finally, this antique silverware chest I paid $2 for is going to be painted and recovered inside to store all my stationery. 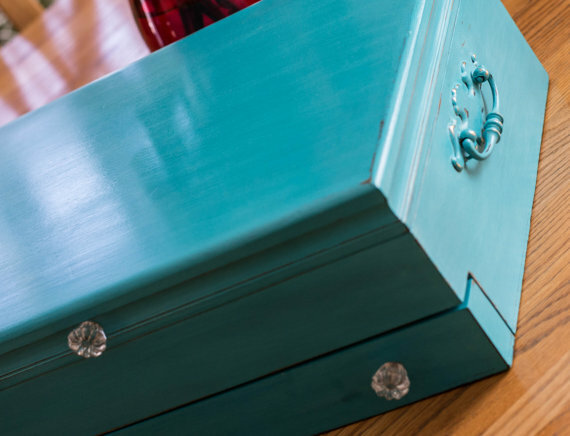 I love the look of this turquoise flatware chest I spotted on Etsy. I’m not 100% sure if it’s the colour I’ll choose for mine. Do you like to go thrifting? Are you able to exercise restraint or do you need to outline a set of rules for yourself before making any purchases? Ooo, love your treasures! No rules for me here, I purge quite often though so the pile doesn’t get tooo huge! Great finds, Shauna! I love the thrill of thrifting, and never knowing what treasures you might run across! Thrifting… One of my favorite words!! ! Amazing Finds- I am excited to see what you do with the lamp shade! Thanks for a dreamy tea break! You did find some awesome treasure! Love, Love, Love it all! Let’s plan a date that I can tag along!!! PLEASE! I love milk glass! I am a bit envious of your collection. I also have a passion for milk glass, and cannot pass it up. 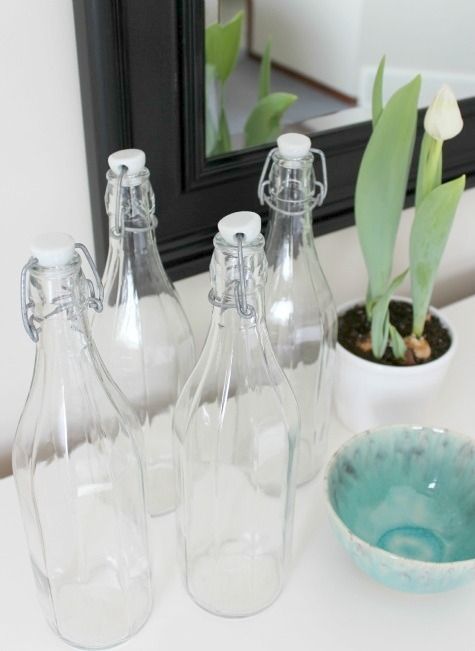 I love collecting vintage mirrors, and vintage white stoneware, old tarnished silver serving pieces, etc… I am a junker (I mean thrifter) :) from way back! You’re too funny! At least you turn “junk” into beautiful things! I can practice restraint! But a great picture frame or plate does make its way home with me on occasion! I recently found a few pieces of milk glass and am keeping my eyes open for more! Ack! Now I know why I haven’t had much luck lately…you’re getting all the good stuff! I collect milk glass too, ahem. I have 2 pieces, does that make a collection? LOL, one day! Can’t wait to see what you do to the silverware chest, great idea!! It’s a start. I really only got going on mine about a year ago. It’s amazing what you can find at salvation army stores and garage sales. I do the exact same thing. Every once in a while I put myself on a boycott of things that need to be diy’ed until the garage is cleared of the current projects. I love your collections and finds! Do the beaded chandelier! It would be amazing! I love thrifting. Recently I added estate sales to the miz and have had so much fun. I’m borderline over the edge and back………. Are you going to come over and help me? I’m going to have to price out the beads and then see if time + cost will be worth it. Great finds! You have a good eye and I love all the plans you have. 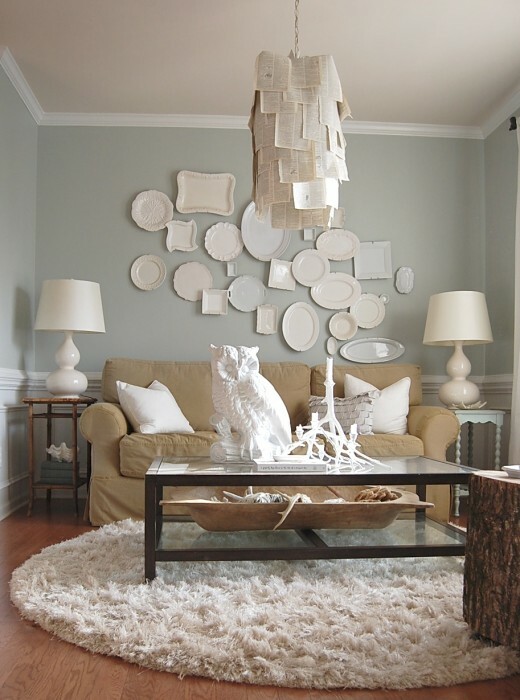 What a fabulous collection of milk glass. It looks wonderful! 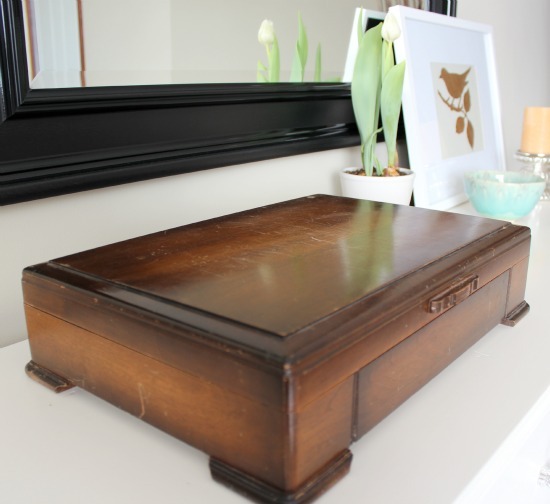 How clever to repurpose the chest for your office! “I vowed I wouldn’t bring home any more fix-me-up pieces until I had dealt with the ones I already had stockpiled”. OH boy you are a brave lady! I have a room where I cycle things… even if I don’t always use it, I MAY use it someday! It’s a sickness, I know of the addiction you speak of… my friend collects milk glass, I pinned the picture of your collection, it may push her over the edge! I do everything you do for myself and for clients. It makes it that much more amazing, when you find things that people can’t necessarily see the outcome and turn it into something gorgeous. Oh, I just have a hard time walking away from beautiful glass and dishes. Definitely my weakness!